Who says that all good things must come to an end? Despite the mild weather, the crew at Whiteface Mountain did an outstanding job of maintaining super conditions on the alpine ski trails this past winter. 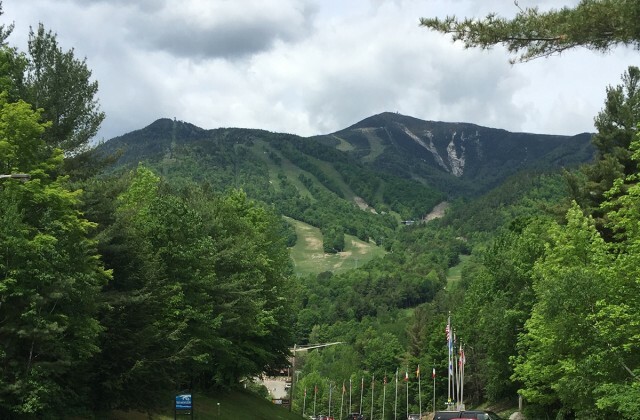 Because of their tenacity, you might be surprised that according to 10 out of 10 ski industry experts at the mountain, it’s just not practical to make snow all summer here in the Adirondacks. Luckily, we can still carve some turns down the greatest vertical in the east during the warm months. We just need different equipment. I tried downhill mountain biking for the first time several years ago. I liked it then, but as I tend to spend most of my two-wheeled time on my road bike, I haven’t returned to hone my skills. This year, I thought I’d revisit the sport and see what had changed as far as equipment and trails and such at Whiteface. So, I contacted my buddy Downhill Mike, who along with Evil Elias and his parents, and High Peaks Cyclery, operates the Whiteface Mountain Bike Park each summer. Downhill Mike and Evil Elias spend their winters in Nevada running the Bootleg Canyon Winter Gravity Downhill Mountain Bike Series in Boulder City. He knows everything about downhill mountain biking - from the latest technology to trail building to racing tactics. And as such, residents of and visitors to Wilmington are beneficiaries of his expertise all summer long at Whiteface. I arrived at Whiteface on a sunny afternoon, wearing my typical road biking gear, to do just a couple of runs and chat. SIDEBAR: I’m guessing that I have to commit more time to the sport first, but I remembered that one of my first impressions during that first attempt at downhill mountain biking years ago was that it would be awesome to have my own superhero name - like Elias and Mike. Downhill Kim seems sort of copycat-like, so I’m open to suggestions. 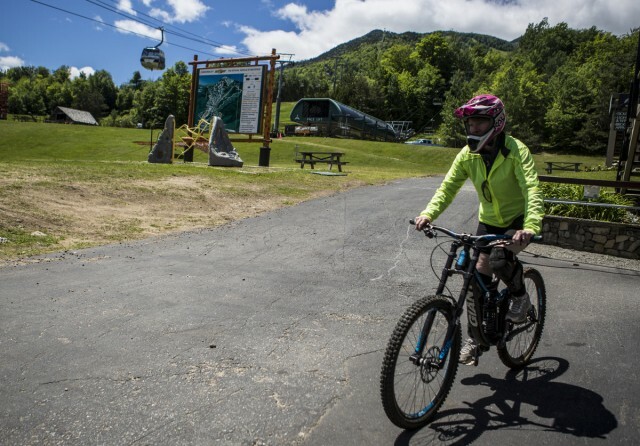 The Whiteface Mountain Bike Park rents bikes, and all bikes come with a helmet. Helmets are required, and full-face helmets are recommended, especially for the expert trails from the top of the gondola. 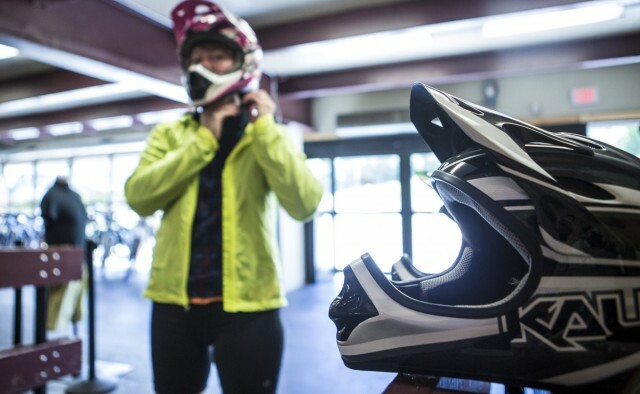 They also rent a la carte chest protectors, knee/shin pads, and elbow/forearm pads, as well as complete packages that include different levels of bike technology, along with protective gear and a lift ticket. 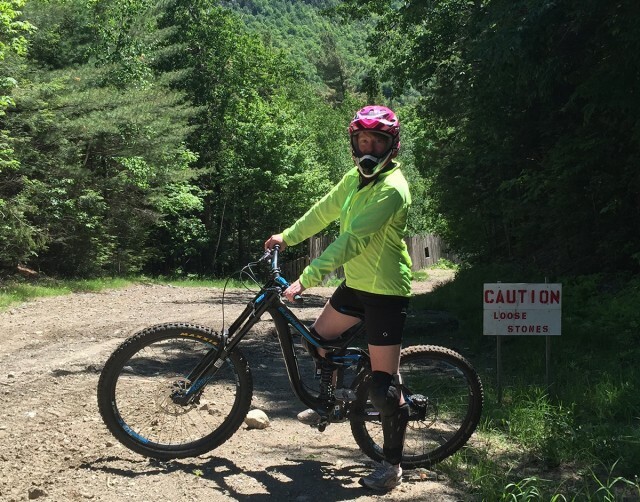 Though a lift ticket gives you access to the gondola that takes you and your bike to the expert trails, I was going to stay on the lower trails, so Downhill Mike set me up with knee-shin pads and a full face helmet in a lovely shade of pink. We set off with Evil Elias as our army truck driver to take on one of the classic runs from the shuttle drop off. (The regular shuttle was undergoing some repairs that day). I had the distinct honor of using Downhill Mike’s personal Giant Glory downhill-specific bike for this run. This isn’t the type of bike you want to have to pedal UPhill. One doesn’t simply sit down on these bikes - one stands on the pedals all the way down the trail with the seat positioned way low and out of the way. And one also should remember that those hydraulic disc brakes are very, very touchy. The downhill-specific bike is very heavy compared to a typical mountain or enduro bike, with shocks that have a huge amount of “travel” allowing for easy navigation over obstacles like rocks and roots, and making it seem like falling onto a pillow when riding over steep drops of several feet. The wheels are 27.5” — as opposed to the old-fashioned 26” wheels of yesteryear. So, why not just ride your mountain bike up and back down? 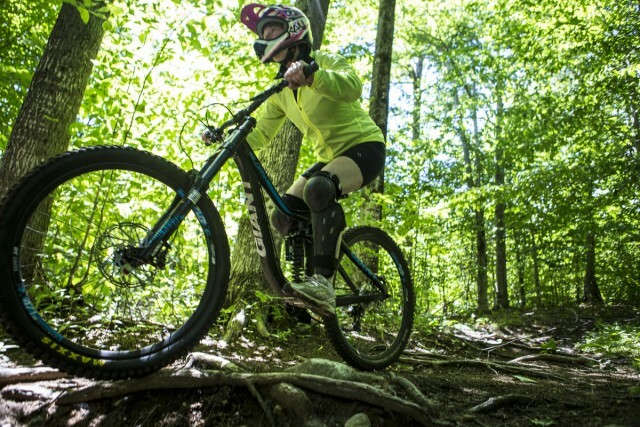 Why bother with a downhill-specific bike that requires lift and/or shuttle access? Well, like in alpine skiing, where you CAN skin up the mountain, you can also ride UP and use the bike trail system. However, consider these words of wisdom from Downhill Mike: “You wouldn’t want to ski down the black diamond trails here on your cross-country skis, and you wouldn’t want to tackle these downhill trails with a regular mountain bike.” Always use the right tool for the job. Plus, like downhill skiing and riding, downhill mountain biking is. a. BLAST. I was riding pretty slowly, but I made it down without incident and with a huge smile on my face. Unfortunately for me, that instinct to go slow works against you on more expert terrain. The bikes are MADE to tackle the roots and rocks, and by rolling over them at a faster clip, they are actually easier to navigate. Just like Downhill Mike showed me. I’ll need more practice to successfully ride the advanced stuff. Still, I got to experience the expert trail #15, but on foot, using Downhill Mike’s bike as a sort of trekking pole with brakes. (No, that’s not my approved new downhill name - yet). All good things truly must come to an end. I finished my excursion and handed in my protective gear and borrowed bike. But I’m looking forward to returning, especially if the rumored new Flow Trail opens up this summer. As I understand it, flow trails are wide, rock and root-free purpose-built courses for mountain bikers of any skill level, that can accommodate any type of mountain bike — no matter if the cyclist is a beginner, or an expert who rides cross-country or a downhill bike. Kind of like biking down a bobsled run. Sounds like something I’d like to try! It should be noted that there are plenty of beginner and intermediate trails, and even some cross-country trails for all levels of riding. Bring the kids! 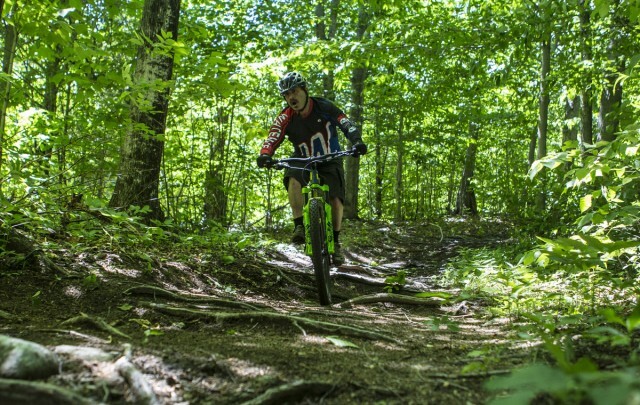 For more information about the Whiteface Mountain Bike Park, go direct to downhillmike.com for detailed information and a trail map. And in case you wondered who said “all good things must come to an end,” the source of the phrase is credited to a poem by Geoffrey Chaucer in 1374. Bike technology back then was REALLY old-fashioned. -Kim Rielly is the director of communications for the Regional Office of Sustainable Tourism, and actually has plenty of nicknames already.